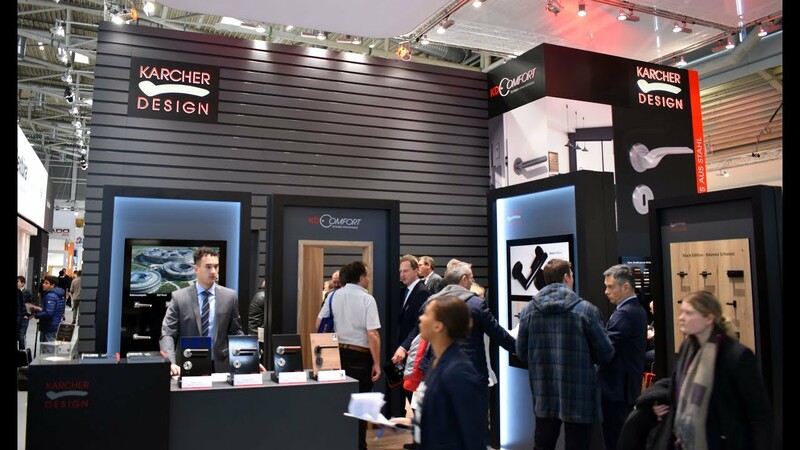 Our parents Irmgard and Ulrich Karcher, who founded our family business in 1991 and successfully positioned our brand in the premium segment with passion and lifeblood, infected us at an early age with their enthusiasm for door fittings. Through clear design language, timeless design at the highest level and the fascination of combining this with the simplest, quickest and most high-quality assembly technology possible, we expanded our strong market position beyond the borders of Germany into the countries of Central Europe. Always future-oriented, we founded Karcher Design NA LLC in Seattle (WA) in 2015 in order to competently serve the US and Canadian markets with perfect customer service. In our exclusive product range, customers can create their own personal, optimum combination of door handle model and rose variant. There are four different rosette types to choose from. Our three-piece standard rose in round or square and the exclusive plan design rose also in round or square. With its 3 mm, the plan design rose creates a clear aesthetic that harmoniously blends into any modern furnishing concept, whether mounted or milled in. With our new patented KD Comfort lock, we have taken on a pioneering role on the European market, because this lock finally fulfils the customer's wish for a lock without a key in the matching design concept. We also offer all lever handle models on glass door locks, protective fittings, lever handles on plate and as window handles. The matching accessories such as pull handles, door stoppers and knobs complete the assortment. Whether made of stainless steel or zamac: Our customers can choose from a wide range of colours, from the classic stainless steel colours satin and polished to the colour combination chrome/chrome satin and the new trend colours oil rubbed bronze and cosmos black. Our diverse product portfolio can be used in a wide range of applications. With our innovative concepts, we give the end customer room for new ideas in high-quality single-family house construction to perfect exclusive interior design. Reduced, linear and timeless design gives the architect impulses and inspiration for the tendering of major projects. Every day our engineers work with pleasure on form and function to make our lever handles an optical and haptic experience for our customers. They are in close contact with renowned designers. This great cooperation of design and development results in innovative designs combined with patentable concepts. We always ask ourselves with attention to detail how we can work out a technically even better solution for our customers. By striving for continuous improvement in product development, design and quality management, the highest quality is a matter of course for us. Our lever handles are certified according to the german industry standard DIN1906 (class 3 and class 4), DIN18273, DIN179, and DIN18257, EN1627 (tested according to BRL3104), and ÖNORM B3850. We regard the continuous internal inspection of our plants as a concrete obligation to supply our customers with flawless, long-lasting products. Our selected partners are qualified supported on site throughout Europe by our sales experts. With a combination of experience, know-how and state-of-the-art warehouse logistics, our qualified indoor service team ensures optimum customer care and flawless shipping. Over the last 10 years we have built up a professional training management and are proud of our highly qualified young professionals. Be inspired by our products and realize your living space. on the surface of the door. This is possible without adapting the rose and can be decided individually by each customer. KARCHER DESIGN offers the PLAN DESIGN rose which is easy to be mounted surface flat. Black doesn’t only look good in your wardrobe! The new cosmos black finish has a matt black appearance. Since 2016 they have been an essential part of the KARCHER DESIGN Black Edition and the range is regularly updated with new products. The finish is applied electrostatically as a powder coating. This procedure does not require the use of solvents creating an eco-friendly high-quality product. KARCHER DESIGN door handles in “Cosmos Black” are scratch-proof as well as highly resistant to corrosion. Their powder coating has a unique and pleasant depth to it while the surface itself feels smooth and warm, not unlike that of a palm stone. Our black products also impressed the jury of the French MIAW Award 2018 and they chose them as the winner. Most products in the “Cosmos Black” range are also available in “Oil rubbed bronze”. That includes the square rose version, window handles, glass door locks and a variety of other stainless steel accessories. The finish itself is dark brown and has a very smooth surface which gives the door handles a rather warm tone and makes them pleasant to use. Every model in Oil Rubbed Bronze has fine bronze colored contours, the defining feature of this elegant color. Within a very short time, our black assortment was met with great enthusiasm by numerous architects in the USA and Europe. At the Kimpton DeWitt boutique hotel in Amsterdam, our Cosmos Black products enhance the ambience and give the interior a complete and stylish look. The products fit perfectly with the other high-quality room elements. At the same time, the black color contrasts with warmer wooden elements, such as the ceiling beams and cupboards. Also in the prestigious Design Hotel Au Boeuf Couronne our Cosmos Black pull handle ES3 and our door handle, Madeira ER45 in Cosmos Black, decorate the doors of the hotel rooms. These harmonize perfectly with the other matt black elements in the room. Visit us at www.karcher-design.co.uk and learn more about our Cosmos Black range. Las Vegas – a city of temptation and pleasure. Casinos, Hotels and other attractions like spectacular shows reflect the special character of this metropolis. The comparison to the desert which surrounds Las Vegas creates a contrast between the dryness of the desert and the modernity and luxury of the city. Exactly this contrast is shown by our new and same titled door handles. Both stainless steel lever handles complement each other in their extraordinary shaping. The handle Las Vegas is defined by its rounded and curved shape. It is available in satin and also in polished stainless steel. The handle runs flat to the end and looks very futuristic. The special feeling when pressing this high quality handle was the main idea behind the design.The jury of the German Design Awards also became aware of the special design of the handle and choose the ER87 Las Vegas as the winner for the German Design Award 2019. The door handle Nevada represents the perfect match to the handle Las Vegas. It looks like the handle is spinning around its own axis. In addition the end of the handle is curved downwards and becomes flatter. Just like Las Vegas the door handle Nevada is defined by its rounded and curved shape. The hand of the customer nestles to the design of the door handle. This is why the shape seems alive and complete. The lever handle Las Vegas is the fourth project in which Karcher Design cooperates with the designer Itamar Harari, who is specialized on architectural and industrial design. Torino, Chicago and Denver were also designed by him and quickly became a success for Karcher Design. Associating the 3.piece rose technology to the new design models can only be a success. These words are the main idea behind the work of Harari – design as pleasure. Karcher wants to connect these thoughts to the design models Las Vegas and Nevada. Two high-quality handles whose design becomes a pleasure through its perfect shape.